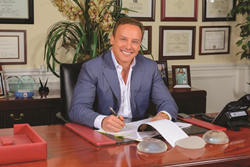 Haute Beauty welcomes renowned Miami-based plastic surgeon Leonard Hochstein to its invite-only network of beauty and wellness experts. The most important aspect of my job is understanding what is beautiful. That should be the starting point for all plastic surgeons because, after all, if you cannot identify beauty how can you ever hope to achieve it? Dr. Leonard Hochstein heads a prestigious surgical center in Miami, Florida, where he provides safe and comprehensive care and treatments that enhance the looks and lives of his patients. Dr. Hochstein has performed over 23,000 breast procedures in his career. He was even awarded Allergan’s Black Diamond Award, which is only granted to the highest level breast augmentation providers. When it comes to non-surgical treatments, though, Dr. Hochstein’s premier MedSpa offers a luxurious retreat, where the latest technologies in body slimming, skincare, hair restoration and sexual health, among other areas, drive individualized, result-driven programs. Over 15 years of training and experience have provided Dr. Hochstein with the skills necessary to achieve countless beautiful and natural results. Dr. Hochstein’s exemplary career began straight out of high school when he applied directly to medical school as a merit scholar. He attended Louisiana State University Medical Center where he trained with the Department of Surgery and published his first scientific paper. In 1990, he received his Doctor of Medicine degree as valedictorian of his class. For the next five years, Dr. Hochstein trained in general and trauma surgery at Parkland Memorial Hospital in Dallas, Texas. During his time there, he found his true passion in surgery where he’d have the ability to directly and somewhat instantly impact the quality of a patient’s life. It was this desire that fueled Dr. Hochstein’s excellence in plastic surgery. In 1995, Dr. Hochstein served as chief surgical resident at Parkland Memorial, where he also published scientific papers, several of which were printed by the Annals of Plastic Surgery. He received the Academic Award from the University of Miami for achieving the highest score on the Plastic Surgery In-Service Exam (an exam taken by every resident plastic surgeon worldwide).